In all cooling systems water is circulated by a pump through a pipe system to remove the heat from consumers like heat exchangers or machines. Two different main types of cooling water systems are used. First the so called open cooling water systems, where the water is open against the atmosphere, either the water is cooled in a cooling tower, or by using already cold river- or seawater. Second, the so called closed cooling water system or closed cooling water loop. Here the cooling water is cooled by a cooling system, such as a chiller or a heat exchanger. Why is a closed loop chosen? Either the temperature of the cooling water has to be so low, that it would be difficult and not feasible to produce such temperatures with an open system. Or the consumer of the cooling water is too valuable or critical for a process. Then no one will take the risk of fouling or blockage, due to an uncertain water quality from an open loop. In other words, in a closed cooling water system the same water is used all the time and circulate by a pump in the loop. The water in the loop is purified before entering cooling system, mechanical and by water treatment. Technically it is easier to assure the same water quality in a closed cooling system than in an open system. For example, when in a big vessel seawater is used direct for cooling a diesel engine, the risk of scaling and fouling at the multimillion dollar engine is far too high. Therefore a closed loop is chosen. Merus Rings are used in many closed loop systems. Corrosion is the biggest issue in the closed loop. If the water in closed loop is always in motion problems with corrosion are less. If the loop branches out in several sub loops, flow is not always given and so corrosion start. Despite using corrosion inhibitor, we see a lot of cases where customers still have big problems with corrosion. This corrosion leads to several problems in the closed loop. The rust is transported by the water through the cooling system. The rust might settle where it causes a lot of problems. For instance, if a machine for plastic extruding has to be cooled a closed loop is used. Often there are very narrow channels inside the mould form for the cooling. These get easily blocked by the rust or iron particles and the cooling is not sufficient anymore. Before installing Merus Rings, we first check the actual situation. We do some water analysis to check the iron content in the water. Very often when starting a project, the iron content is far above 10 ppm. Depending on the size of the chilled cooling water loop, we install at smaller cooling loops, direct at the chiller or heat exchanger providing the cold. 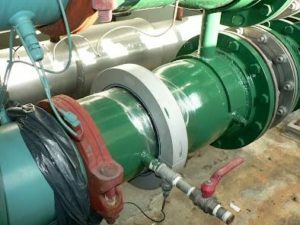 In a big system, like a shopping mall, a big office or apartment building, we install several rings throughout the cooling water system. At the main pipe where the cold is coming from. And at sub loops after the pump. During the project we check the quality of the circulated water a few times. Measuring the iron content, but also visually, by checking the turbidity and the color of the water. After some weeks, the water is found almost totally clear and the iron content has stabilized below 2 ppm. 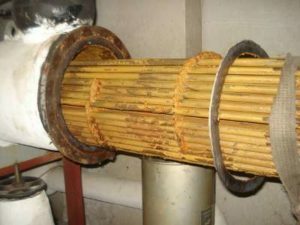 The picture to the right shows a heat exchanger tube bundle from a chiller. A lot of scale and fouling found at the tubes. This is the open side of the cooling loop, connected to a cooling tower where the debris is coming from. Inside the tubes the cooled water is flowing and there the water is perfectly clean. Most of our customers change their water treatment in the closed loop system. If the corrosion is stable they stop corrosion inhibitor, after seeing the reports and the quality of the water. The ROI, when calculating the savings of the chemicals and the less need of maintenance, is normally less than one year.